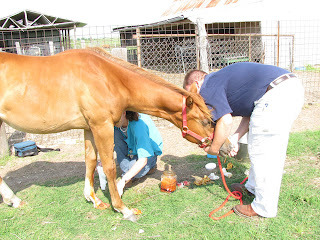 Being the owner of a horse is no small responsibility. They are high maintenance animals that come with large feed bills and even larger vet bills. But Trixie has been worth every penny, even the ones I had to dig in the couch cushions for to pay the vet off yesterday. Thursday evening, after Trixie was put in her stall for the night, she was spooked by the cows. Now, in Trixie's defense, this was the first time the cows had been let into the lot that is adjacent to her stall. It was dark, and all she knew was that where there used to be nothing, there was suddenly a living, breathing being beside her that she could not identify. 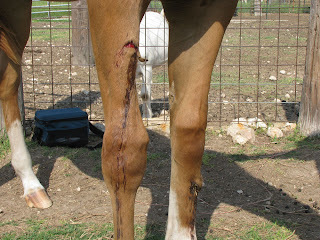 She tried to jump the fence and caught both front legs on it, putting a good gash in each. A call to the vet was in order. 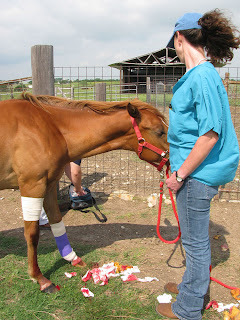 On Friday morning, the vet came out armed with medicine, bandages, and most importantly, sedatives. 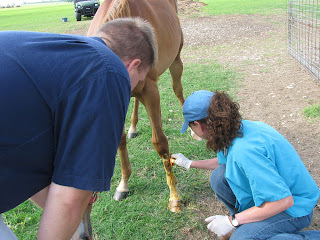 Trixie was quickly sedated and the vet and his assistant got to work. Both gashes had ugly, v-shaped flaps of skin that had to be removed. 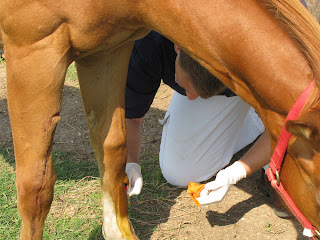 After cleaning the wounds well and cutting off the flaps, the vet carefully wrapped Trixie's legs, giving me instructions as he went. Ron and I will have to change these dressings every other day. Trixie is expected to make a full recovery. I, on the other hand, am not sure I can handle much more drama. Those are some nasty gashes. I am surprised there was no stitching involved. 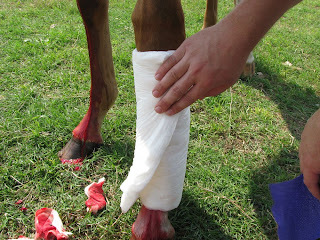 I had one of my horses fall on his knees and need serious stitching on one. But yes the vet bills are miserable. And a big ouch. I hope all heals well.